Tested for Southern Ontario landscapes at the University of Guelph Trial Gardens. A winding path set amongst Pennisetum alopecuroides 'Hameln', Panicum virgatum 'Warrior' and Hemerocallis. How do you catch something that is invisible? When I was a youngster, our family would go to the beach on a regular basis. Sometimes it was so windy that my mother would help us set up a windscreen, fashioned out of a beach blanket and fastened by a car door on either side. We thought it was a great adventure to snuggle in our beach towels in this shelter and eat barbecued hot dogs and sip hot chocolate, a windy day was usually cold as well. At the beach, the wind is seldom invisible. It pushes the water toward the shore, curling it into giant whitecaps along the way. Sailboats are designed to catch and use the wind for power. Windmills are another classic example. But why would anyone want to capture the wind in the garden? Strong, gusting winds can cause all sorts of damage in the garden, broken tree limbs, collapsed delphiniums and tattered roses. And yet, a gentle summer breeze is refreshing and soothing. Is not the perfect summer day one with sunny blue skies and a gentle breeze? Wind also adds an extra dimension to the garden, movement. Along with movement comes sound. Consider the rustling of Miscanthus or the gentle rattling of the dried seedpods of last summer's poppies. Are these not sounds to be treasured? Even without our help, a garden will catch the wind. Just try to take a close-up shot of the first delicate bloom of a columbine and you will quickly discover how sensitive these plants are to the moods of the wind. The slightest breath of air, and they bounce as if mounted on springs. Movement is associated with energy and life, and so it follows that by adding plants that sway gently in the breeze, a sense of liveliness will be added to our gardens. Miscanthus sinensis 'Zebrinus' (zebra grass) moves gently in the soft summer breeze. By adding plants that sway gently in the breeze, movement will be added to the garden. Stipa tenuissima (Mexican feather grass) is a wonderful choice for capturing the wind in a garden. If you have any doubt about the value of movement in the garden, I suggest a visit to the Toronto Music Garden, located on the shores of Lake Ontario. This garden is filled with massed groupings of gentle Miscanthus (Japanese silver grass), Panicum virgatum (switch grass) Calamagrostis (feather reed grass) and Perovskia (Russian sage) set into motion with the slightest breeze. The rustling sounds of the grasses and trees help to calm and soothe visitors to the garden. The noise and stresses of the city are soon forgotten. Even on a still day, the garden is in constant motion with the buzzing of bumblebees, lighting of butterflies on nectar rich flowers and songs of the birds, although you may have to sit still for a few minutes before you notice and appreciate this persistent, rhythmic movement. A spray of Miscanthus will suddenly spring back into position after a perched songbird resumes its flight. In his book, Designing With Plants, Piet Oudolf suggests: "grasses depend upon wind movement for their pollination, so it is entirely appropriate that they register its motion more expressively than do other plants." His text goes on describe, "Those with long stems and heavier flowers or seed heads are particularly sensitive registers of movement." We are fortunate to have many modern examples of designers who include ornamental grasses in their projects as a way of introducing movement into the garden: Julie Moir-Messervy (designer of the Toronto Music Garden), Piet Oudolf and the fathers of "New World" landscapes, Oehme and Van Sweden, to name but a few. 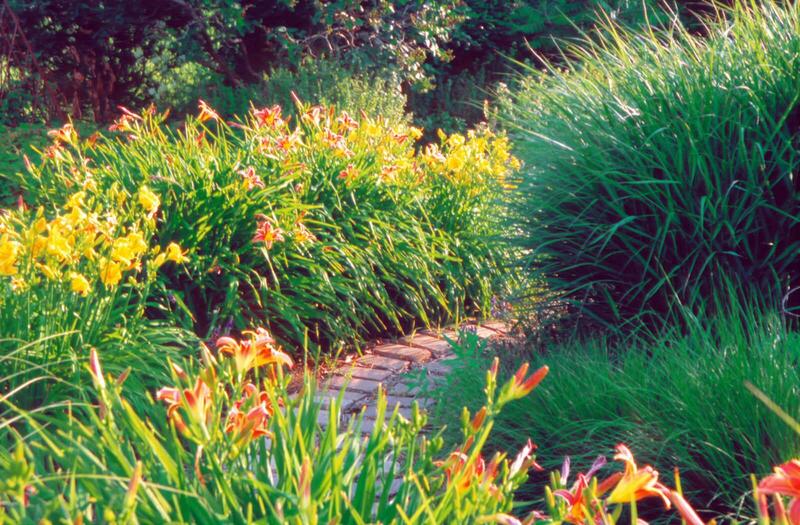 Their gardens are examples of the value of graceful, soothing perpetual motion evident in meadow-like plantings of self-sufficient perennials and ornamental grasses. In preparing for this article, I discovered something new. With the selected slides on my light table, it quickly became apparent the plants that best catch the wind are also excellent reflectors of light. It would seem that the gentle flower and seed heads that catch the wind are also wonderful for catching the light. In the garden, the wind has many voices. It can be soft and gentle as it stirs the large leaves of a maple, swoosh as it slips through a field of grasses or rustle through the willows. In the autumn, the wind occasionally takes on a harsher voice; it becomes more raspy and crackling. A resplendent autumn maple will shed its colourful foliage after an afternoon of unrelenting wind. The fallen leaves continue to dance in the stirrings of the autumn wind, until they finally settle under a sobering blanket of snow or heavy rain. In a garden where you wish to follow the movement and sounds of the wind, it is best to wait until spring to cut back the previous year's growth. Most grasses and numerous perennials will stand erect and tall over the winter, often straightening themselves out after a heavy snowfall weighs them down. Sound may not seem an important factor in the winter garden, but take a stroll through the garden and listen to the rattling of the dried stems of Miscanthus or the rustle of Panicum, as a frosty breeze stirs and awakens these sleeping giants, it is truly a magical sound. Theresa M. Forte is a garden consultant, columnist and photographer based in Niagara Falls, Ont.